Indonesia’s presidential and parliamentary elections this month come at a time when a majority of Indonesians are optimistic about the state of their country’s democracy and economy, according to a Pew Research Center survey conducted in summer 2018. Indonesia is the world’s largest predominantly Muslim country and the third largest democracy. And while the survey found positive feelings about its political system among Indonesians, the 2019 election is being held against a backdrop of political and economic tension. In 2017, the capital city’s former governor was jailed for blasphemy, and the religiosity of President Joko Widodo (also known as Jokowi) has been questioned by his more conservative critics. The country’s relationship with China has also taken center stage this election cycle, as accusations of foreign hacking and disapproval of bilateral trade policies have surfaced. The survey found that views of China and the United States had worsened among Indonesians since the country’s last general election in 2014. 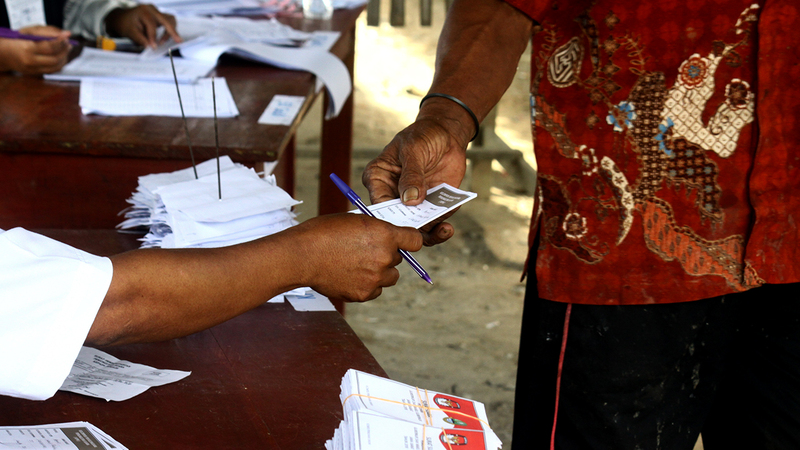 Most Indonesian adults report voting in elections: 20% of Indonesians have voted in the past year and 71% say they have voted in the more distant past. Here are five facts on public opinion leading up to the April 17 presidential election. 1 Many Indonesians are satisfied with the state of their democracy. About two-thirds (65%) of Indonesian adults said in the 2018 survey they were satisfied with the way democracy is working in their country. This positive sentiment is similar to attitudes in 2017, when 69% of Indonesians rated the way their democracy worked positively. However, there is a partisan split in satisfaction with democracy. 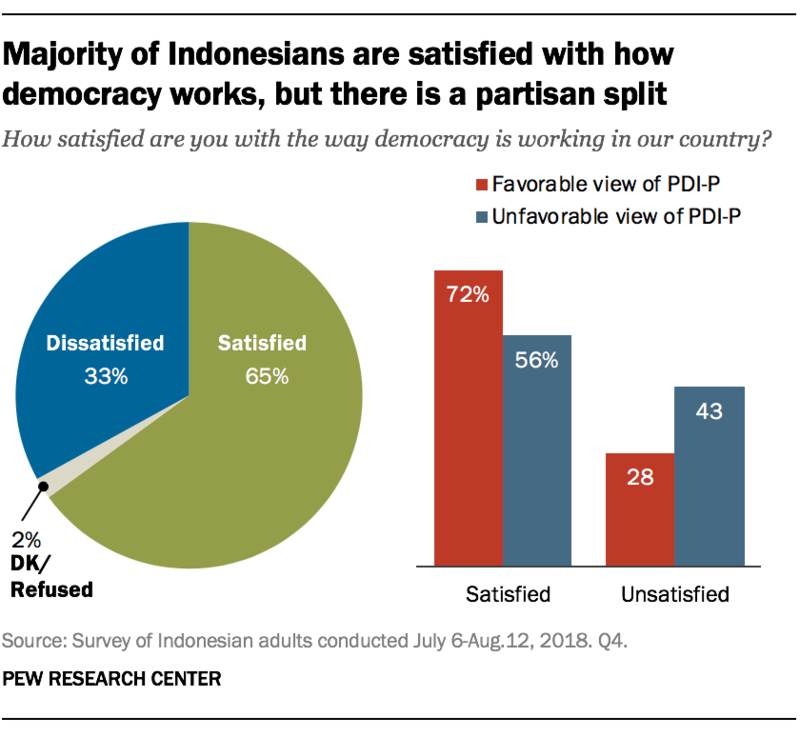 Among those who hold a favorable view of the incumbent’s party, the Indonesian Democratic Party of Struggle (PDI-P), 72% said they were satisfied with the way democracy is working in Indonesia, which is 16 percentage points higher than those who hold an unfavorable view of the PDI-P.
At least half of Indonesians hold favorable views toward all political parties surveyed. Nearly six-in-ten hold favorable views toward PDI-P, but a similar share says the same about opposing presidential candidate Prabowo Subianto’s political party, the Great Indonesia Movement Party (Gerindra). 2 An increasing share of Indonesians describe the country’s current and future economic situation as good. Before Jokowi was elected, about six-in-ten (62%) said the economy was doing poorly, but by 2014, more people rated the economic situation positively than negatively. As of last summer, about two-thirds said Indonesia’s economy was doing well. The share of Indonesians who say their current economic situation is good increased to almost two-thirds (65%) in 2018. This positive sentiment stands in contrast with the state of the country’s currency, the rupiah, in 2018 – whose value depreciated to near record-low levels, edging close to values seen during the 1997-98 Asian financial crisis. This optimism about the economy is also present in respondents’ views of their children’s future: Three-in-four say that they will be financially better off than their parents, while only 17% say they will be worse off. 3 Six-in-ten or more Indonesians say they are likely to take political action on a range of issues, but most say they have never actually participated in civic activities. About two-thirds (66%) said they would take action such as contacting an election official or participating in demonstrations when it comes to poor quality schools or health care. Roughly as many (65%) said they would do so if the issue was poverty, and 62% said they would engage in political activity in support of freedom of speech. While majorities said they were likely to get politically involved on some issues, large shares of Indonesians said they hadn’t done so in the past. Roughly seven-in-ten (71%) said they have not and would never participate in an organized protest or post their thoughts on political or social issues online. More than half (54%) also said they would never attend a political campaign event or speech. The exception to this is voting: In 2018, a large majority (91%) said they have voted in the past year or in the more distant past. A similar share (89%) said the same when the question was asked in 2014. 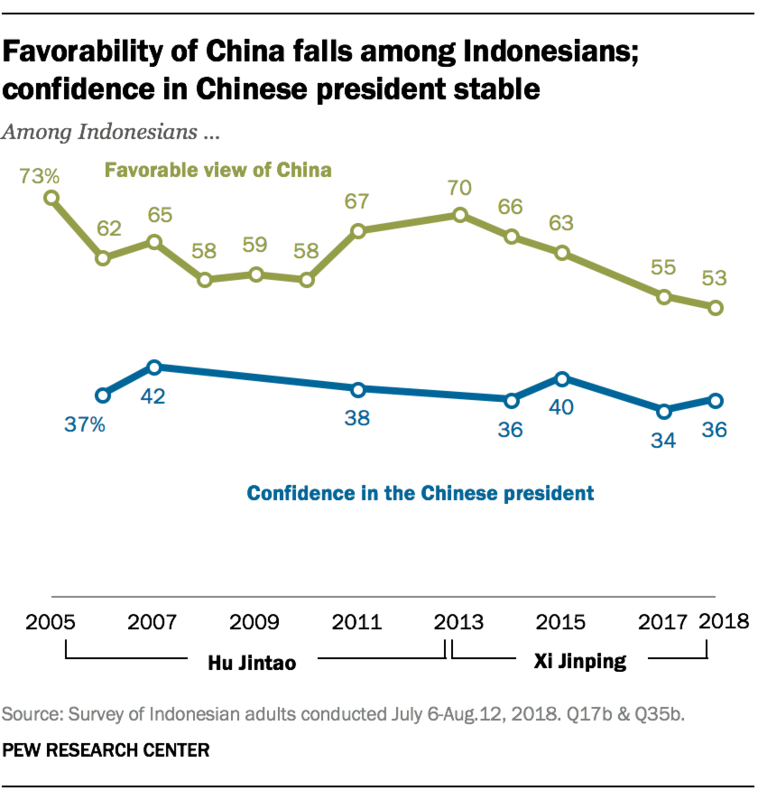 4 The share of Indonesians who hold favorable views of China has declined over time amid concerns over increasing economic dependence on Beijing. In 2018, 53% had a favorable view of China, down from 66% in 2014, the year of the last Indonesian election. Confidence in the Chinese president to do the right thing regarding world affairs has remained relatively stable over time, with only 36% of Indonesian adults expressing confidence in the current leader, Xi Jinping, and a similar share expressing confidence in President Hu Jintao in 2011. However, in both 2011 and 2018, roughly three-in-ten (31% in both years) offered no response. More than four-in-ten Indonesians said China’s power and influence is a major threat to their country in the 2018 survey, versus only 27% who said this in 2013. 5 Favorable views of the U.S. in Indonesia have fallen sharply over the past three years. In 2018, 42% of Indonesians said they had favorable views of the U.S., down 6 percentage points from the previous year and 20 points from 2015, when Barack Obama was still president. Roughly three-in-ten Indonesians (28%) in 2018 said they were confident in Donald Trump’s ability to do the right thing regarding world affairs, down from the 64% who had confidence in Obama in 2015. And 52% of Indonesians in 2018 saw U.S. power and influence a major threat. Despite the falling favorability of the U.S. among Indonesians, only 22% of Indonesians believe it would be better for the world if China was the world’s leading power. Meanwhile, 43% said it would be better if the U.S. occupied that role, nearly twice the share who would prefer China’s leadership. Abby Budiman is a research assistant focusing on global migration at Pew Research Center.